In Books & Reading, My Life. I spotted my first Little Free Library at the Omni Starbucks in Richmond, Virginia almost two years ago. I noticed it—I even instagrammed it—but I didn’t really know what I was looking at. The first Little Free Library—though it wasn’t called that yet—was built in Hudson, Wisconsin in 2009. Todd Bol built a miniature one-room schoolhouse to honor his mother, a teacher who loved reading. 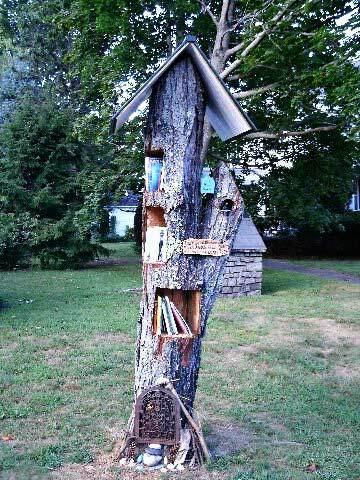 He filled it with books, and put it on a pole in his front yard with a sign that said FREE BOOKS. It was a hit. He built several more and gave them away. The grassroots movement caught on. Bol’s original goal was for 5,210 Little Free Libraries: that’s one more than Andrew Carnegie built, which would make the Little Free Library movement the world’s largest library network. Now—just a few years later—there are about 15,000 officially registered Little Free Libraries. 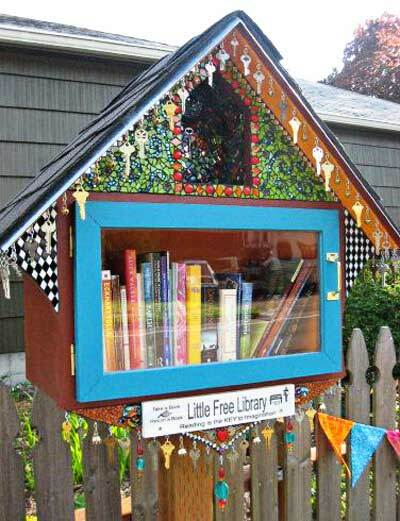 The Little Free Libraries come in all shapes and sizes. 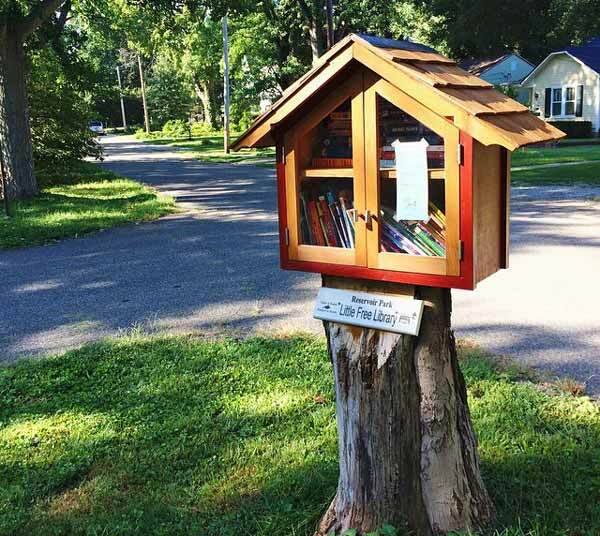 Kits can be purchased on the Little Free Library website, or owners can create whatever kind of structure they’d like, limited only by their imagination and, in some instances, zoning laws. 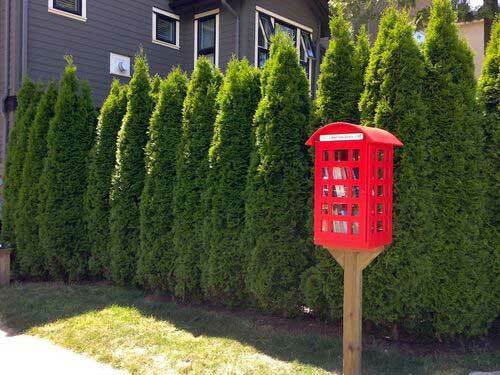 Some Little Free Libraries are shaped like birdhouses; some are shaped like phone booths. Some are carved into trees; some are carved into garages. Some look like school buses; some look like RVs. 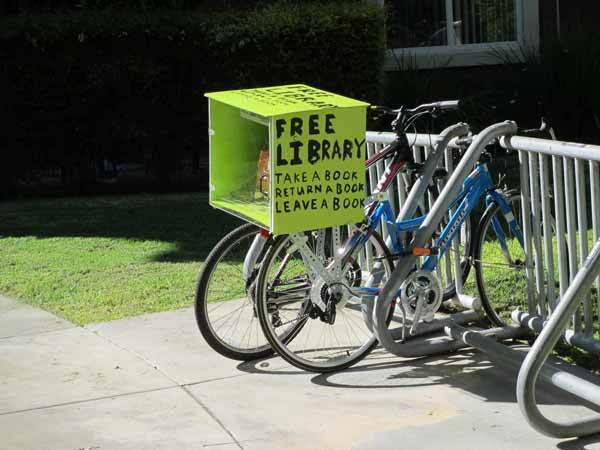 There’s even a Little Free Bike Library. Personally, I love the miniature house-shaped ones that the creators personalize in every way imaginable. I made Will stop the car on a busy Pensacola street so I could jog back a block to snap this photo. Can you blame me? 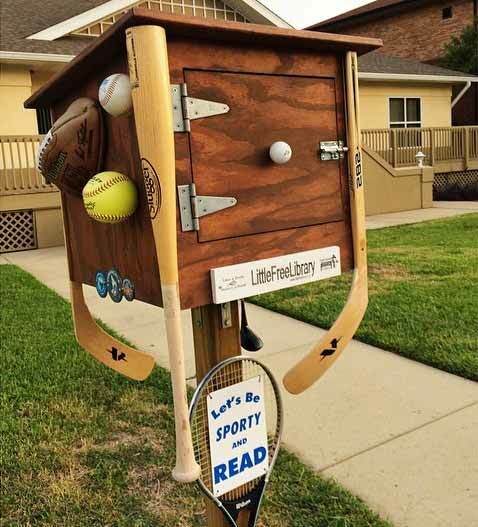 Do you have a Little Free Library near you? Would you ever want to have one yourself? And if you know of any more in Louisville, let me know so I can hunt them down! P.S. You can watch a twelve-minute documentary about the Little Free Library movement here. P.P.S. One past obsession. And another one. 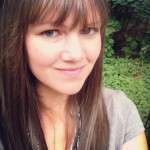 Previous: Raising babies and writing novels. I’ve seen one of these on Disney Channel…yeah I know. But I had no idea it was such a big movement. Those libraries are so cute! I saw one at a park recently and never would have paid attention to it, except that I’d seen one on your blog before. The one I our HOA has the same stuff in it always. More for decoration than use. Yes! There were 3 in a 1 mile radius of my old house. Hubby wanted to build one and never got around to it but he would flip for the baseball one! I live in the Milwaukee area and they are all over the place. Several in our neighborhood and surrounding neighborhoods. They have also made an effort in one community to place them at non-profits that service financial challenged families (food pantries, shelters, etc) to provide it as a resource to them and encourage reading/literacy. We have discussed putting one up in our yard but haven’t taken the plunge yet. Some cute ideas here though. I love the idea of installing them where low income families can easily find them. We have one in front of our house. I wonder if we could get neighbors together to create one to donate to the Salvation Army or something like that. Thanks for sharing! I’ve never even heard of Little Free Libraries, but after looking at the map, I can see there are TWO on our short drive to school. I’m going to be checking them out this morning! Update: I found both of them on our drive home from school, plus an extra one that I didn’t know about! What fun! I want to put one on our street. I would really like to put one up. We’ve talked about it, I wonder if it would be used in my suburban neighborhood, but it wouldn’t hurt to try! We do get a fair number of people strolling by our house. Whenever I see one it makes me smile! I love these, too. So far I think I’ve seen three near where I live (well, within a 45 minute radius), one lives in the same yard as a yarn-bombed tree (would LOVE to meet those people! ), another is near a community garden, and the third is at the beach! Oh! I really really want one. I totally get it: whimsy + books! Mm! Love it! I live near Madison, WI and I know of one in the next town. 🙂 These are so cool! This is amazing! I would love to see one of these in my town! I love this! Thank you for sharing! Yes, I love these! We live in Seattle and we pass two on our walk to school and my kids check them every single day. We’ve gotten some fun books that way and I pass on old books too. Everybody wins. These are awesome! Who knew there was one at my local flea market?? We’ve had one in our neighborhood in Raleigh, NC for many years. Now that they are becoming more popular, it’s getting more action, which is a lot of fun. We live in an historical neighborhood. Our next-door neighbors put one up–it was a miniature version of their house–and then the Historical Society made them take it down. Boooooooo, hisssssss! Oh no! The miniature version of their house idea sounds adorable. About two months ago, it seemed like overnight my little New York City neighborhood of Inwood popped up three of them! I don’t think they are “Official” Little Free Libraries, but they are small book shelves labeled “Leave a Book, Take a Book” and we have one in front each of our local coffee shops. I’m obsessed, too! I follow you on Pinterest, but I can’t figure out how to send it to you. I found it when I searched Wizard of Oz, and it’s on my Wizard of Oz board, if that helps. 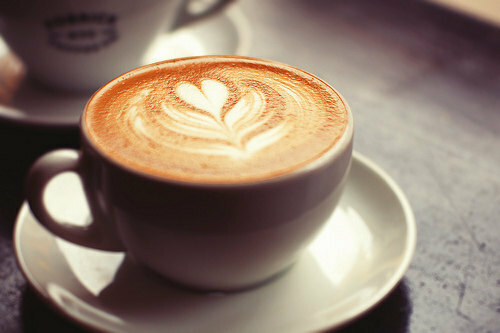 That’s fantastic! Thanks so much for the pic; I pinned it to my own boards. Your Youth Advisory Board did one this past Spring. It’s in a local park in Huntsville, TX. I’ll have to check and see if there are any more in my area. The last time I checked, there are three Little Free Libraries in my city. I’m thinking of starting one, since there are none on my side of town. We have several near us and can never resist stopping to take a peek! we found one near us that was a little Tardis – since my daughter and her cousin are HUGE Doctor Who fans, of course we had to visit! We took goofy pictures and loved leaving a book and taking a book. Such a fun idea! There are several in the Corvallis area! I’ve seen that one before, it is beautiful! We have one every 3 blocks or so in our neighborhood of St. Paul, Minnesota! I think we have so many because the town where they started isn’t that far away. This is also a neighborhood with three colleges within walking distance of each other so readers abound. Thanks for the great post! I have one! I just put it up last weekend, in fact. It’s been so fun! I’ve had several “customers” and it’s a great way to get to know fellow book lovers. 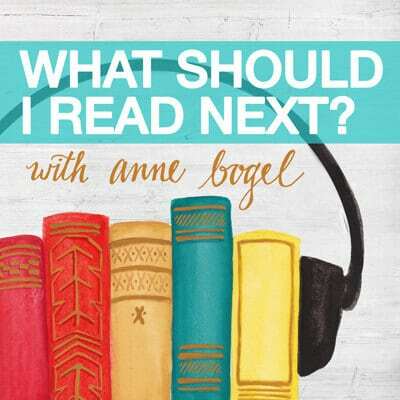 I am a huge bookworm but generally do not re-read books, so this is a perfect way for me to “share the wealth.” I’d love to answer any questions if you have some! PS – We live in Brookfield, WI, which is a suburb of Milwaukee. There is another one in my subdivision and at least two more within an easy drive of me. I haven’t seen any in my area. I’ve known about them for a long time and have loved the idea from the start! I didn’t know you could search to find one near you. I’d love to build one, but I doubt our HOA would allow it. They can be ridiculously picky at times. How funny, I just saw my first one yesterday in our town park. Sadly, I didn’t have time to go take a close look since I was toddler wrangling. Will have to go back another time and peruse its selection. I’ve seen two in our area. I looked at the map though and it seems there are more. I get so excited when I see one! I have never noticed one! But golly, I want to put up one now. I need to go check out the links. There are several of these in my neighborhood. It’s kind of fun to see the literary taste of various neighbors, based on what books they put out! 🙂 I want one of our own, too. So fun. I love this idea! My friend found one last month on her block after she moved to Philadelphia! She sent me a picture and I was smitten. I had no idea it was a whole movement though! Now I really want to make one!!! I saw one of these out in the woods on the Appalachian Trail. Wracking my brain where… I think NY or CT. 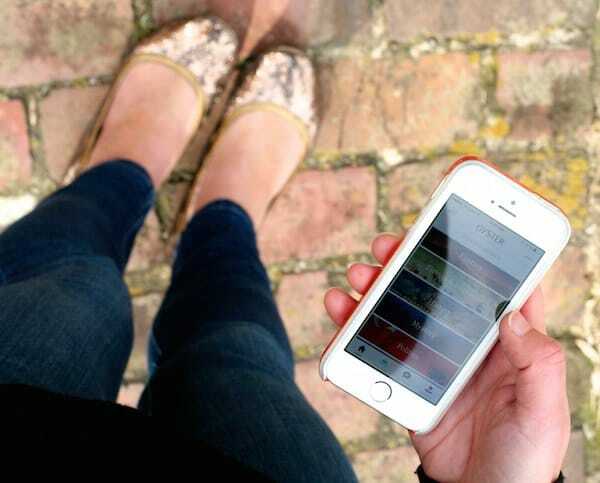 I took a photo, when I edit the photos when I get back home if I remember I’ll send it to you. It was the coolest thing to see, in the woods of all places! A Boy Scout in our neighborhood was responsible for bringing 4 new LFL’s to our area for a total of 5! They are so cute . I absolutely love them! I’ve wanted one ever since I first found out about the Little Free Library! I even have the perfect neighborhood for one, and can’t figure out why we don’t have one already. I saw one of these just yesterday! I was SO confused, and didn’t have time to turn around and go back and figure it out. I officially now want to move to the neighborhood where I saw it!